Life is all about Nature’s Laws. Take for example a plant which is wilting or turning yellow. Would you rush off and take your plant to a doctor of botany to have it diagnosed, then have the disease treated? I don’t think so. More likely one would check the water, the soil and the sunshine. Too little or too much of any of the above requirements will create a sick plant. Balance the laws of nature (water, soil, sunshine) and miraculously that plant bounces back and heals. We are no different. We are just a more complex organism; therefore, we have more laws of nature. Because we are not animals we have lost our instinctive nature to know when and how we have become out of balance. Be introspective and truthful to determine which law of nature you are out of balance with. From there you can either balance this law yourself through your own health knowledge or you can hire a professional who lines up with the workings of that natural law. Note below that each law has a profession that backs up that natural law. 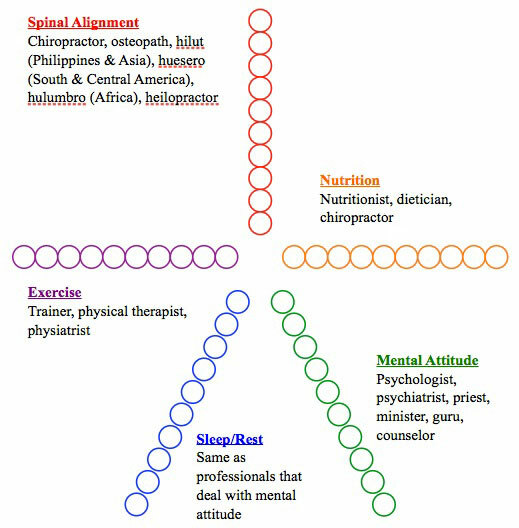 To complete the wellness wheel fill in the dots from inside-out based on your level of balance per each natural law. Rate yourself. The further out you fill-in the more balanced you are. 1 = not balanced, 10 = very balanced. Repeat Wellness Wheel every 6 months to see your progress.